Stuffed peppers have long been one of America's favorite comfort foods. While the typical stuffing includes ground beef and rice, home cooks have developed many creative versions over the years. The fillings for stuffed peppers are limited only by the cook's imagination. The filling might be a simple rice and vegetable mixture, or it could include poultry, fish, shellfish, or pork. Bell peppers are the conventional choice, but jalapenos, mini sweet peppers, or poblanos are all excellent...MORE alternatives. Or convert a recipe to appetizer portions. Instead of standard bell peppers, use colorful mini bell peppers with the meat or vegetable filling of your choice. Stuffed peppers usually include the starch, vegetables, and protein, so what to serve with them? Roasted potatoes are a good choice, or one or two vegetable sides, like roasted Brussels sprouts, steamed green beans, butternut squash, and sweet potatoes. Or add a tossed salad for a simple, yet satisfying lunch or dinner. Here are some of our best recipes for stuffed peppers, including vegan and vegetarian options, along with an unstuffed pepper casserole that the family will ask for again and again. This baked dish is the classic recipe that you probably remember from childhood. Ground beef, tomatoes, cooked rice, and a variety of seasonings make up the delicious filling. The filling in these peppers uses south-of-the-border ingredients like Mexican chorizo, potatoes, zucchini, Monterey Jack cheese, and creamy queso fresco. Serve them with rice and beans or make it a simple meal with some warm tortillas. A jar of marinara sauce adds flavor and makes preparation a breeze in this slow cooker version. The filling contains ground beef—or turkey if you want a leaner option—along with some rice and seasonings. Looking to lose weight, but not flavor? Reduce the number of onions in the recipe if you are following a low-carb or ketogenic diet. A large green bell pepper only contains about 5 net carbs. 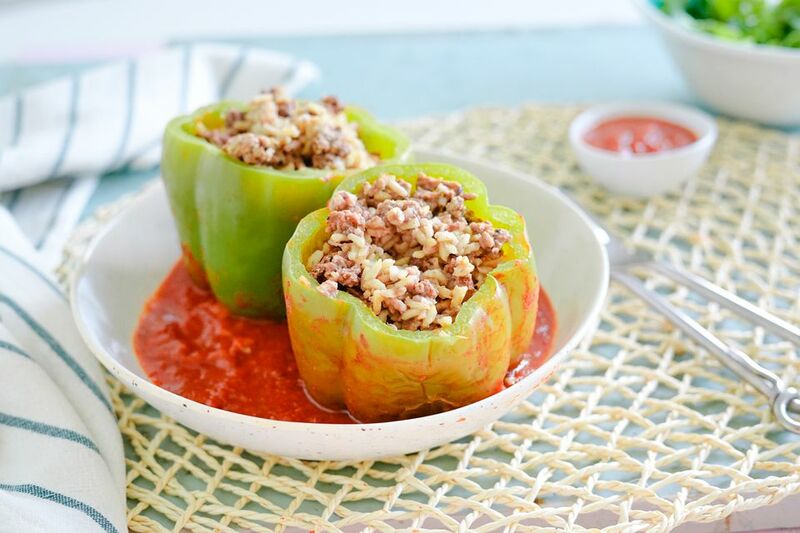 These tasty stuffed peppers, paired with a hot chicken and rice salad mixture, is a great option for those looking to steer clear of the traditional beef. A curry mayonnaise mixture brings the ingredients together in a potent, spicier combination. For Philly cheesesteak fans, this recipe offers a healthy way to replicate the same flavors without having to reset your belt. Just like its sandwich inspiration, they contain thinly-sliced grilled flank steak, mushrooms, and provolone cheese. When in doubt, turn it into a casserole. We've all cut something the wrong way, diced when we were supposed to do strips, ultimately ruling out the bowl shape we were going to load up. Should that happen here, this streamlined recipe includes the same classic ingredients and flavors in a delicious cheese-topped casserole. Serve the one-dish meal with a side salad and biscuits or French bread. Cheddar cheese provides the protein in these tasty vegetarian stuffed peppers. Add some black beans, corn, and diced tomatoes for extra heft and Tex-Mex flavor. These stovetop ham and cheese stuffed peppers make a tasty lunch or dinner dish, and they are super easy to fix up. 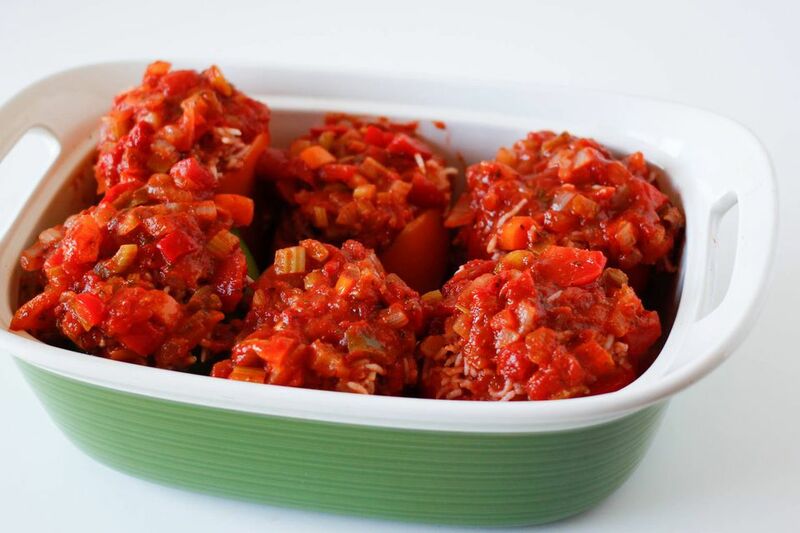 If you prefer baked stuffed peppers, transfer them to the oven and top with extra cheese or buttered breadcrumbs. Quinoa and lean ground sirloin make the filling for this variation lighter than most. Chopped carrots, onions, tomatoes, and Parmesan cheese add both color and flavor. Jalapeño peppers are a departure from main dish stuffed peppers, but they deserve a shout-out. Fry a batch up for a party or game day gathering. The breadcrumb and tuna filling makes these stuffed peppers a great choice if you're seeking variety. Add a salad or cup of soup for an excellent lunch or light dinner. Whole kernel corn sweetens the filling in these stuffed peppers. Ground beef, tomato sauce, and rice are the main ingredients. Add some chili powder and a dash of cayenne pepper to give the dish Southwestern flavor. Bulgur replaces the more typical rice in these Greek-style vegan stuffed peppers. If you aren't vegan, add some feta cheese to the peppers just before serving. The Peruvian-inspired filling for these peppers includes a hard-boiled egg, ground beef, black olives, raisins, and cheese. In Peru, hot rocoto peppers are used, but feel free to make the recipe with sweet red bell peppers. The filling in this recipe features Tex-Mex flavors. Refried beans, salsa verde, ground beef, and Southwest seasonings are among the ingredients offering a smoky-spicy flavor. Top these peppers off with cheddar cheese or use a Mexican blend or pepper jack cheese to add a creamy texture. Couscous is the grain used in these flavorful vegan stuffed peppers. Scallions, some diced multi-colored peppers, lemon juice, and parsley add color and flavor. The filling for these peppers is a warm and aromatic rice and pine nut mixture seasoned with a variety of spices, diced tomatoes, and currants. How Much Heat Can Your Food Handle?